With the release of the Prince of Persia game only a few weeks away, Ubisoft has officially announced that they will be offering a cool reward in the form of a free unlockable download for the game. 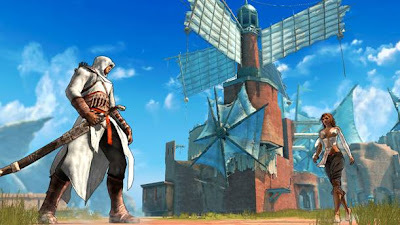 Fans who purchase the Price of Persia game and link their Ubisoft.com account with their Xbox Live or PlayStation Network accounts will be able to download the skin of Altair from Assassin's Creed. "Prince of Persia is an incredible experience. We're thrilled to give our loyal fans another way to journey through it," said Ben Mattes, producer for Ubisoft's Prince of Persia video game. "This exclusive reward is a 'thank you' to our fans, who can easily unlock it when they link their Ubisoft.com accounts to their Xbox 360® or PLAYSTATION®3 gamer identities." This is definitely exciting for fans of both games who will have the opportunity to play Price of Persia clad in Altair's white and red colours. You can create your Ubisoft.com account on the Prince of Persia game site and then link it when you start playing the game. Prince of Persia is scheduled for release on December 4th for the Xbox 360, PlayStation 3 and on December 11th for the PC.